Despite moderate temperatures for February, yesterday seemed very warm here. 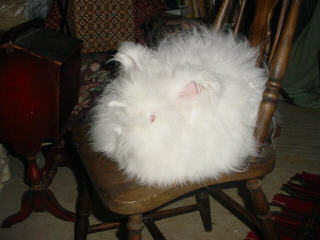 So I got busy and sheared Miss Angel, because she was overdue and looked uncomfortable in her heavy coat. She seemed very happy to have it taken off and was prancing around at feeding time as if to show off! Angel is a nice doe from old lines, very quiet and easy natured. This must be my 27th "First Knitting Project". Thanks to Chris, though, this time I may get it. I learned about swatching from her and it was easy to see why that's necessary! 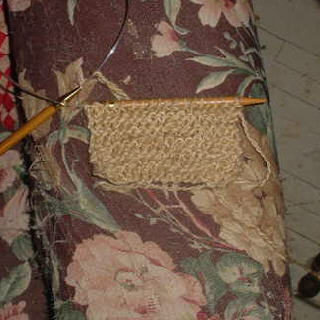 My swatch went beautifully; every stitch looked right and I was comfortable with how it was going. Naturally when I started the 'real' project I messed up. First I somehow managed to get extra stitches per row...rip...figured out what I was doing there and now things seem to be going along evenly. There are a couple of weird looking bumps but I'm chalking that up to handspun yarn and not looking too closely. Chris was very patient and strained her eyes over a picture to tell me what my gauge was. No telling how many more silly questions I'll have for her, and this is just garter stitch!